I'm in a tizzy of excitement. I've just had a last minute invite to Woolfest. Must go and organise knitting to bring, fleece wishlist and try to remember some self control. In the meantime here are some pictures of the wonderful things we found in the Cotswolds the week after Ravelry Day. The wonder of UK Rav Day started off rather damply and if you look at the group pool on Flickr there are many pictures of a pair of rather damp alpacas. They and the stallholders stoically withstood the driving rain for the delight of the Ravelry members and the city of Coventry. The event was held in Coventry Central Hall which is in the care of the Methodists. They made us feel extremely welcome with a minister on hand in case we needed Divine Intervention and a fine line in cakes. On every table in the cafe there was a leaflet, specially written for the day with a welcome and an explanation of what the Methodist church was all about. I thought it was a nice touch and wished we'd had a Ravelry leaflet to leave in return. I had decided to do a workshop that challenged me so I chose to learn about Kitchener Stitch with Woolly Wormhead. What a revelation, Wooly W. thinks about knitting in mathematical, technical terms and that shines through in the way her hats are designed. I came home with new skills and an ardent wish to go back to school and get my maths O Grade. Next time? What we did the rest of the week! 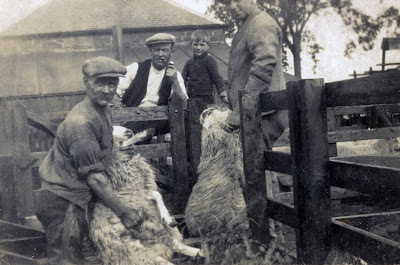 I promise that I will tell you all about the wonders of the UK Ravelry day last week but in the meantime here is the proof that I come from a long line of fleece wranglers. The shearer is my father's grandfather who was a shepherd for all of his life as were at least two of his sons. Dad sent me an email this evening bursting with family snaps. I love the way that technology can keep us in touch with our ancestors. The lad and I went North this week taking a car stuffed with camping gear and emergency chocolate. We were headed to the aptly named Archiestown in Speyside. Our tent has it's own living space with room for a table and chairs. We also had a dishwasher and a fridge - of the camping kind. We had true Scottish weather - rain, hail, wind and evenings so cold that you could see your breath, making me thankful that I packed mittens. Many an hour was spent listening to the rain and reading. There was time to let imagination flow - I thought that the view of the trees through the tent window plastic looked like an Impressionist painting. And then the sun came out and the world became even more glorious.